Watch the trailer for Anna Netrebko's first studio album in 5 years: "Verdi", released on Deutsche Grammophon. In diesem Video spricht Anna Netrebko über das neue Album, die Zusammenarbeit mit Gianandrea Noseda und ihre Art, Verdi zu interpretieren. 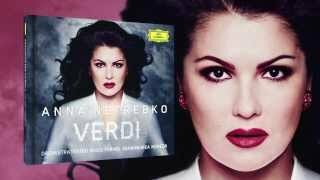 Watch theTV Spot for Anna Netrebko's first studio album in 5 years: "Verdi", released on Deutsche Grammophon. This sumptuous, all-Verdi programme is Anna's heartfelt birthday tribute to the master of Italian grand opera, with selections from Il Trovatore, Macbeth, I vespri siciliani, Don Carlo and Giovanna d'arco.